It has been a strange year to be sure. I started off with the best of intentions with what was a relatively sensible project list that probably did not survive past January the 2nd! On reflection I seem to have a pretty elastic interpretation of the word 'list' - but everything on it usually gets some attention at the very least - maybe not quite as much as I would have liked though! The biggest highlight for me this year was the impact of the 20mm WW1 Middle Eastern collection - I say impact because the acquisition and rather rapid disposal of the same has enabled me to tackle a number of other items - projects that may not have seen the light of day otherwise. the main beneficiary was my new Hexon set up as well as finishing off the capita ships for my Jutland 2016 project. there are a few other ideas in the mix as a result of the sale - the 10/12mm ACW set up being one. Mention of Jutland has of course reminded me of yet another missed deadline - I had hoped to have the capital ships completed for the end of the year but at the time of writing I am still 25 ships short. I was able to complete the paining of 6 ships today though - they are merely waiting varnishing and the basing. One of the 'distractions' has been the realisation that next year - 2015 - sees the bicentenary of that rather significant punch up in Belgium in June 1815. I am of course referring to Waterloo. My feelings about this campaign and the place that it occupies in my personal wargames story needs little by way of a reminder so I shall refrain from repeating myself. Suffice it to say I shall be doing something by way of a commemoration - using a combination of of Columbia Games divisional level boardgame - Napoleon for the strategic level movement and my block armies for the tactical side. The game uses combat values varying between 2 and 4 for the divisional sized units so translating these into standard Memoir of Battle/Command and Colours units should be easy enough. In truth I have a lot of material ready for this idea from a few years ago so bringing it up to my current thinking should not be too onerous. Next year then will see two things happening for sure - something 1815 related and further work on the Jutland project. Those two are the main protagonists for the ear but that does not mean I wont be dabbling elsewhere - I just need to keep things manageable. 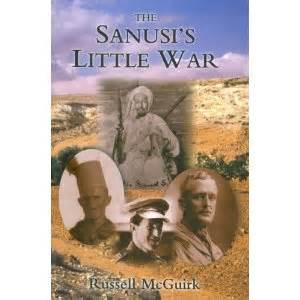 Contenders for the 'something else' category include Saga - the Crusades version, Salamis, the ACW and something Sanussi related. I also rather fancy something sci-fi based but am not sure what. 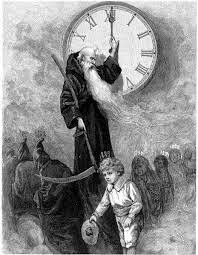 It only remains then for me to wish you all a peaceful and prosperous new year and I hope that I shall be back in the blogging groove rather more frequently than of late! Christmas greetings to one and all! The only thing I can readily confess to is redicovering my 1815 Waterloo campaign mojo - probably just as well given the impending bicentenary. Needless to say I have a cunning plan. I have also renewed my acquaintance with Charge! My Messrs. Young and Lawford with a view to something rather radical for the new year. I am at a loss to explain where the last twelve days have gone - I seem to have been doing a fair impression of a headless chicken - but things are now approaching was passes for normality in my neck of the woods. Work has been busy and SWMBO has been deep in festive planning - which usually means a lot of driving around for yours truly - but we have at last arrived at the "one more visit and we are done" stage. This means that I can at last pick up on a couple of outstanding items on the project pile - mainly completing the last of the capital ships for the Jutland re fight. I have 31 ships to complete by the end of the year and mercifully I am off work from Christmas Eve until the fifth of January which will give me a good run with the brush. The plan is to have them all finished by the end of the year so the final blog post for 2014 will be the fleet reviews. There has also been a major change in my computing set up as I have finally dragged myself into the current century and have acquired an IPad. According to my daughter that now qualifies me to be one of the cool people. I must confess that I am enjoying using it and it suits my needs admirably although I will need to keep an eye on the memory aspect as it is the 16gb version. I have also been looking long and hard at the Sanussi revolt and what came before (and after as well) and am thinking that froma portable war game perspective there is a lot of potential. It is not something I am looking at in the short term but at some point I reckon it will feature. This weekend has been one that turned out completely different from was originally planned - Christmas domesticity rearing its seasonal head once again - and the panting plan has gone right out of the window! I will not bore you with all the tawdry details - suffice it say that much driving around, raking of leaves, redesigning the Christmas decorations and shopping - but the battleship painting has barely moved from last week. 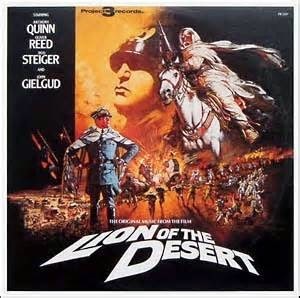 What I have managed to do though is to catch up on a film that I have never seen before - the Lion of the Desert starring Anthony Quinn and Oliver Reed. I recently picked up a cheap copy on Blu-Ray and I have to say I was really impressed! 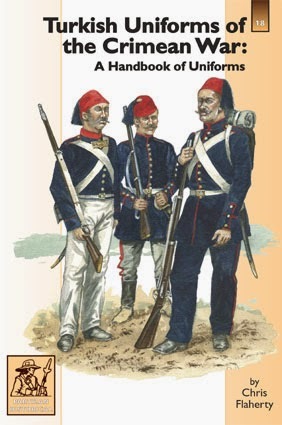 The whole campaign - about which I know absolutely nothing although I have some material on the earlier Sanussi Revolt and the Italo-Turkish War - would make for a really interesting wargames campaign. Omar Mukhtar (played by Anthony Quinn) was fighting against the Italians since 1911 until he was captured and hung by the Fascist colonial forces under the command of General Rodolfo Graziani (Played by Oliver Reed). During this time Mukhtar gave the better equipped and far more numerous Italian forces a real run around using his superior knowledge of the terrain to full effect. I certainly need to find out more about the Italian occupation - starting with the original invasion during the war with Turkey. Aside from being the title of a very good book on the subject the rules of the game is something I have had on my mind to various degrees since the beginning of this project. I have considered and discarded numerous sets - some homegrown, some commercially available - but have finally settled on what I want to use with a few 'tweaks'. The plan is to use the original rules from the Avalon Hill game incorporating some of the subsequent amendments from the sadly defunct AH General and Boardgamer magazines. There will also be a further tweak in that the current 'light ships' rules will be modified to better reflect the scouting and screening use of such vessels. The rules have the advantage of being designed to generate games from an operational map movement perspective - which I intend to replicate on 'Der Tag' in due course. I will need to type up the final version and to prepare play sheets etc as the published rules are a little in the 'dog's breakfast' school of rules layout with examples and a less than logical format making for a somewhat irritating experience in my opinion - especially when you start including advanced and optional extras etc. The work starts now but naturally painting the models comes first. The latest title from Caliver Books - as pointed out to me by that very nice Mr. Fox - cheers old chap! No surprises for guessing what has just crept to the top of my Xmas present list! Available now from Caliver Books for £17.50 and needless to say I am really looking forward to acquiring a copy. I will need to source some details on the Russian army of the period but suspect that will be somewhat easier. "I can resist anything except temptation..."
Following on from last post I spent some quality time yesterday working on the remaining 18 battleships for the Royal Navy. All of the models have had the two shades of grey dry brush applied and so the next phase will be the decks. As mentioned previously I have a couple of spare evenings this week so the plan is to use that to tackle this - it is the fiddliest part of the process - with the intention of finishing them all by the close of play on Sunday next. In the meantime (and to get myself motivated after the events of last weekend) I have been reviewing the various rules options for the project and am now a lot closer to deciding what I want to do and how I want to do it. The deed has been done. The 12 models that needed a repaint have at last been started. I took a long and critical look at the varnish damage and decided that the repair work would be too involved and too fiddly so the only option was to start them again. So, this afternoon I managed to get them undercoated and then was able to apply the first dry brush coat to the entire remaining 18 models. The lighter grey shade will be applied tomorrow and then it will be on with the decks etc with the plan being to have all 18 ready for the close of play next Sunday. As luck would have it I have a couple of spare evenings coming up and so more painting time has been allocated than would be the norm. This will mean that I will have all of December to complete the Germans - 7 dreadnoughts and 6 pre- dreadnoughts. In the meantime though - and being somewhat enigmatic in the process - I shall be getting a game in using some newly acquired models. "Dust yourself off, brush yourself down....and start all over again"
The final 6 models for the RN will be included with the above - so in effect I will be painting 18 ships in total which will finish the RN capital ships for the Jutland project. If I am honest I have gone through the angry phase and am now at the 'coldly efficient and keen to get started' version. "We want 8 - but we'll have to wait!" I am not a happy bunny. By the close of play Saturday evening the current batch of 8 Royal Navy battleships had been finished and but for the lack of any varnish would have only needed yours truly to finish the bases which was to have been the Sunday job. In fact, this post was to have been the photo shoot. I should also point out that I had needed to make some very minor changes to 4 other battleships to bring them into line with the two additional models I had painted to complete the classes - basically I had 4 of the 6 Bellerophon/St. Vincent types and needed the other two for the project as all 6 were at Jutland. The shading/highlighting on the last two was slightly more noticeable so I fine tuned the other 4 models to bring them up to the same standard. The varnish had dried up so I opened one of the two new tins I had (I was using Humbrol enamel). Being mindful of the potential problems with a new tin I took all manner of precautions - stirring and shaking the tin thoroughly - so was confident that all was well. To be even more sure I tested the varnish on an older model just to make sure. It dried perfectly....or so I thought. The next morning, before we went out Christmas shopping, I made a point of varnishing the 8 new models and 4 touched up others after having checked the test sample - rather too quickly as it turned out. Six hours later, upon our return, I came home to an absolute horror story. The varnish had dried to a milky white in all the crevices - around the bases of the superstructure and funnels as well as between the gun barrels. Under close inspection the same thing had happened on my test sample only I had missed it. I was distraught. There was absolutely no way to amend the damage easily - remember my technique involves generous amounts of dry-brushing which is awkward to carry out locally on a specific part of the models without it looking out of place. After having scrutinised the whole sorry batch the only conclusion I could make was that the 8 models will need repainting from the main deck upwards and to make matters worse, the 4 I was merely touching up will also need the same treatment. I could not bring myself to tackle it last night - it was too painful to contemplate! I know on the global scale of things this is small beer - after all no-one has died - but my painting time is really precious these days and so this this is a bitter, bitter blow to my timetable. I have never had this happen before - my only varnish dramas were restricted to the odd matt coat coming out gloss which is easily rectified or the very occasional metallic paint lift although the latter was firmly exorcised when I adopted acrylic metal colours some years ago. My mood is dark but hey ho, onwards and upwards and back in the saddle once again - I shall be tackling these later in the week. H.M.S. Agincourt - in 1/350th scale. Very impressive indeed! I happened to be reading Bob Cordery's blog Wargames Miscellany earlier when I was reminded of a book I read many years ago by Richard Hough - The Big Battleship. The book was the story of the only battleship ever built with seven main turrets housing 14 x 12" guns. I had forgotten about this book so Bob's post was a welcome reminder - and needless to say it is on the 'to get' list. Coincidentally the ship is currently on the painting tray along with seven other models as the penultimate batch of ships for the Royal Navy comes to a close. She had an interesting career and no mistake as she was originally ordered by Brazil and then taken over by Turkey - only to be requisitioned by the Royal Navy at the outbreak of the Great War. 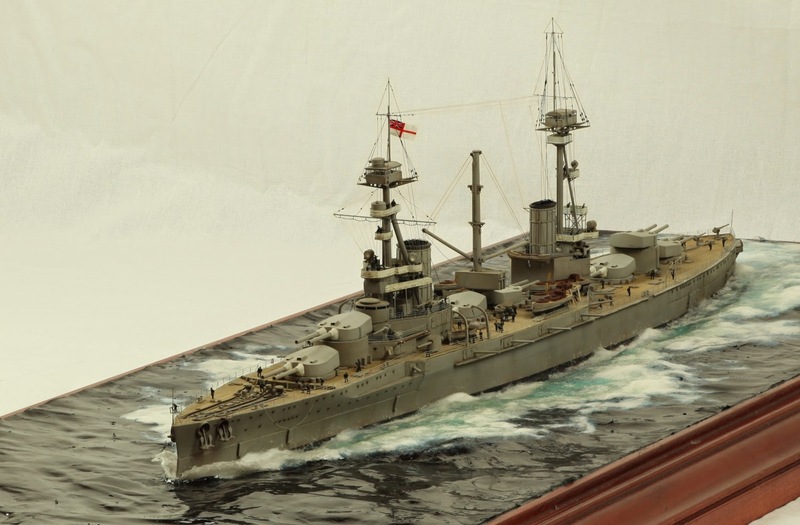 The RN were less than impressed by the ship for a number of reasons and the model shown depicts her after the great flying bridge over the two turrets amidships was removed. Whilst the 1/2400th version I am painting will not look as impressive it is still a bonkers looking battleship and one I am fond of - especially because of the Turkish connection. Things that make you go....'Ooooh Shiny! This is the title of a really good by Peter Duckers and sure enough, it has given me much to think about! To my eternal shame and embarrassment my knowledge of the Crimean War is very limited with my knowledge of the naval side even more so. 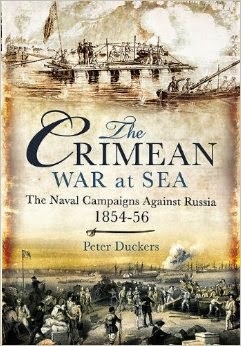 I had no idea of the scale of operations carried out in the Baltic and the Black Sea (not to mention the Sea of Azov) and although there was no Trafalgar-like fleet action (there could have been though) the scope of minor actions involving raids and shore bombardments - real combined arms stuff - certainly give plenty of ideas for scenarios. I really want to find out more about the Turkish side of the conflict - especially as they managed to drive the Russians out of Bulgaria - as the British and French were originally planning on deploying troops in the Balkans in support. Naturally their navies would be covering the seaward flank in the Black Sea. 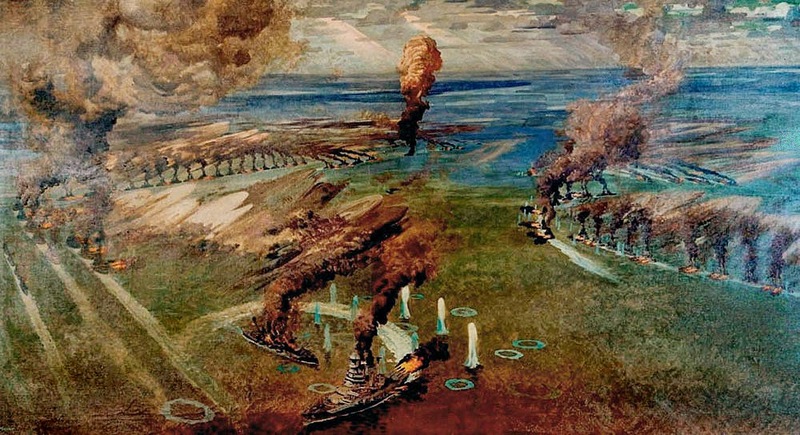 Of course after the Russians had been driven off (and after they had manage to all but destroy the Turkish navy at Sinope) the allied plan was to render Sevastopol unusable and the rest, as they say, is history. Although very much a transitional period in naval warfare the writing was certainly on the wall for sailing warships - the value of steamers for inshore work had been noted and so paddle steamers and screw sloops etc came to the fore. I have a couple of ideas of where I might be able to take this and if I am honest, the period has more potential for me than perhaps the history would indicate. With work on the capital ship element of the Jutland project resuming once again (or more accurately speeding up from dead slow) I have again been thinking about the thorny subject of light cruisers and destroyers in the game. There is no doubt that the capital ships will be the stars but the supporting cast must also have their fifteen minutes so to speak. I have previously mentioned that I will be scaling the numbers down for these elements - in the case of the destroyers this decision has been taken out of necessity as some of the types are simply unavailable in 1/2400th - and have more of less settled on cutting the light cruiser numbers in half. I am undecided about destroyers though. For a variety of reasons many of the naval games I have fought over the years have usually featured a massed destroyer based torpedo attack. Destroyers then assume an importance in a fleet action out of all proportion to their actual abilities. Of course they are an essential element of a battle fleet but I am unconvinced that many rule sets 'dumb them down' sufficiently when used in large actions. I recall reading that at Jutland a little over a hundred torpedoes were launched in the battle and that the hit ratio was something around the five percent level. This is hardly the great torpedo fest that a wargame would routinely feature! My feeling is that the threat of a torpedo attack was far greater than the actual effect and so I will aim to factor this in to the rules I ultimately decide upon. The Avalon Hill game Jutland allows for commanders to turn away from a torpedo attack this nullifying it and this works well enough. Taking all this into consideration I shall be using representative bases for the destroyers based on their actual composition which will cut the number of models down and also ensure that that destroyers are handled with a little finesse than is usual. Torpedoes are effective when they hit - I just do not want that to be too easy to do so. H.M.A.S. Australia in all her 1/2400th glory. She will have a couple of light cruisers and four destroyers for company - just the thing for chasing down German raiders in the Pacific. The other two ships in the class - with apologies for the ever-so-slightly blurred picture. The earlier Invincible class. The Indefatigable class was not a great improvement over these ships - it was only when the Lion type came along was any real advance in the battle cruiser concept from the Royal Navy perspective. H.M.S. Invincible - lead ship of the class and lost at Jutland. H.M.S. Indefatigable - lead ship of the class and lost at Jutland. The two lead ships from each class for comparison purposes. The six models are from Panzerschiffe in the US and, if I am honest, are fairly basic even by their standards. I suspect that these are old molds and the presence of some odd pieces of flash and sink holes would tend to confirm this. The rear funnels on the Indefatigable class is a little odd on a couple of the models and is canted over slightly. There is also the curse of the partially cast gun barrel in evidence. Panzerschiffe are happy to exchange models that are not up to standard due to casting problems but if I am honest the hassle of organising transatlantic replacements is not worth it as they are not that bad and have painted up well enough. I used my usual black undercoat and dry brush in various shades of grey with block painted decks and lifeboats. All were finished in enamels except for the ship's lifeboats which are in white Vallejo acrylic. As an aside I was really impressed with the Vallejo paint and intend a phased conversion to using them for all my painting going forward - how about that for dragging my painting into the 21st century at long last?! I now have 14 capital ships remaining for the RN and 13 for the Germans before I tackle the cruisers and destroyers. The next batch of the RN ships (8 in total) are now under way and have had the preliminary grey dry brushing so I am hoping to get them completed over the coming week. ....but take a look at the map! Instant imagi-nation if ever I saw one! It was also very good value at a mere 75p. On a separate subject the outdoor boot sale season is winding down but we have a local indoor version that whilst being small has turned up a couple of goodies over the years. Today was no exception as I picked up a rather useful chess board with 6cm squares and a rather handy board game. the chess board will be seeing service for a number of Portable Wargame type ideas and the board game has a very nice hex based mounted map of a fantasy style world. No prizes for guessing what that may be used for! My word how time flies! Since my last post on 28/09 a few things have been on the go but it has been largely underwhelming on the gaming front - much planning and thinking of great thoughts has been the order of the day - with little else to show for it. Not a bad read - although even for me it is a little cliche-ridden! I have been extensively gaming albeit in a rather unusual fashion. One of the chaps at the office introduced me to a very good Chess 'app' - Chess with Friends by Zynga - and I have been playing him relentlessly for some time now. I expect most gamers have (or are still playing) played Chess at some point and there are obvious war game connections. It as been challenging and a good work out for the grey matter - so much so that I dusted off a couple of Chess books I have in the collection - so in the absence of a wargame will suffice for my gaming fix for the time being. 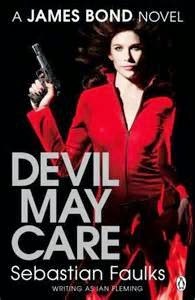 I allowed myself the luxury of reading Sebastien Faulks James Bond novel - Devil May Care - and have to say that whilst I enjoyed it (being a huge Bond fan) it did seem to almost catalogue elements of every Bond story written - even using much of the same phraseology - which did grate after a while. It is a good story though and I would recommend it. The '4, 3, 2' of the title is a reference to the way I shall be organising my 10/12mm collections and represents the ratio of foot to horse to guns I shall be using. I have opted to use 4 bases for infantry, 3 for cavalry and 2 for artillery - which is of course the system in use for pretty much all the Command and Colours system. I have also been thinking about my ancients 'fix'. If you recall I posted on many occasions about the Greek and Persian war - culminating in Salamis as the naval option. Whilst I like the idea to tackling the armies using figures it is becoming less likely that I will. I have a couple of ideas in mind - the second Punic War for one - but I am having some serious thoughts about the wars of the late Roman Republic - the century leading up to AD. The reasons are compelling - multiple opponents ranging from the usual Celtic and Germanic hordes via Eastern armies and a whole host in between, not to mention the civil war(s). As ever, 10/12mm will be the scale of choice. No progress on the ships sadly although I have all that I need from the capital ship perspective. Time and enthusiasm have been a premium recently but I shall persevere. Today is my 54th birthday and for the last couple of days (well Thursday and Friday to be exact, with the return on Saturday morning) SWMBO and I have been staying in a converted Oast House in the heart of the North Kent countryside. We stayed in the tiny village of Herne Hill which is within easy distance of Faversham (the home of the Shepherd Neame brewery), Whitstable (famed of its Oysters) and of course, Canterbury -famous for being, well, Canterbury. We had a super time traveling around, eating some delicious food and enjoying the hospitality of the 700 year old Red Lion public house - located around 2 minutes from where we were staying. The church from which the Oast takes its name - directly opposite where we were staying in fact. Its claim to fame is that it has buried within its ground some of the victims of the Battle of Bossenden Wood in 1838 - the last 'battle' fought on British soil. The village green. The church is directly behind from where this picture was taken with the Red Lion in the distance. Note the Oak tree on the right. The Red Lion - every bit as good as it looks. The food was outstanding! The main entrance to Canterbury Cathedral. Sadly we did not have time to have a look around but it is certainly one for the future. I have visited previously - back in around 1972 as I recall! Whilst on our travels we visited a number of secondhand bookshops and the odd charity shop and so I am now the proud owner of the three titles you see above. I should point out that the Barbarossa title actually came from the Canterbury branch of the Works and I was really pleased to get this - especially as it was only £6.99 rather than the £30 cover price. Essentially is is a slightly revised and expanded version of the three Osprey campaign titles covering Barbarossa being the North, Centre and Southern sectors. The Blandford was most welcome and I was also pleased to pick up the Sharpe Companion - both of which for a couple of ideas I have kicking around. All in all then, the last few days have been very relaxing and enjoyable - with a great mixture of good food and drink, history, scenery, new books and most of all the chance to get away for a couple of days with my beloved! 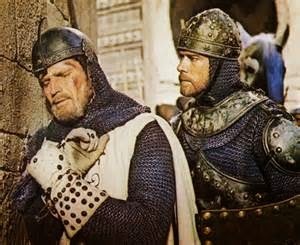 El Cid is one of my favourite films and it is probably no surprise that I have often contemplated how best to game the period. There are some trulylovely figures available in 28mm his period - 11th century Spain - but given my usual aversion to such things I have managed to avoid getting involved in that particular scale - my painting skills would struggle to do the models justice in any event. Luckily those awfully nice people at Hat have come to the rescue with some 28mm hard plastic figures for the period that are relatively basic detail wise and so well within my modest skills with a brush. I shall be acquiring some tomorrow at Skirmish in Sidcup all being well. My curiosity for this period and gaming the same has been picqued by the whole Saga approach - large skirmish level really - especially the part that does not involve huge numbers of models and, via the additional set you see above, covers the era I am particularly interestd in. The new Osprey set - Lion Rampant - are also geared around games of around 40 to 60 figures a side and so are well within my capabilities. Two such forces could also be used for anything DBA/HOTT related as well as Command and Colours. The book you see above about El Cid is really good and I also have the title by the same author on Spartacus. I am a sucker for the historical Hollywood approach to epic battles and so my liking for the latter as well should come as no surprise! My holiday reading when In Andalucia was the Moors in Spain by Stanley Lane Poole and that also served to get the creative juices going. I now own 40 of these shell splashes although surely they indicate misses rather than hits...? The Jutland project. I have ordered the RN armoured cruisers and also the representative light cruisers for both sides. I have decided to go with formation bases for the light cruiser units - usually depicted with a single model and with a couple of models for the destroyer forces. 10/12mm figures. I have laid in the figures requred for a specific set up - both armies - and will be discussing this further in a later blog post. It is slightly unusual in respect of the choice of period and came about in a rather unexpected fashion. Dare I say it but this could actually be described as am 'Ooh shiny' moment. Again, I needed to add some reading material to the collection in support of the models. Sci Fi. I picked up a set of rules I had my eye on - and am very glad I did. Alien Squad Leader can best be described as a fusion of HOTT and the Blitzkreig Commander series of rules and they look like a lot of fun. I have assorted bits and pieces suitable for use with these rules already in the collection so it will be a cheap, quick and easy set up to organise. Hexon. This one has already been mentioned previously but by and away is the biggest single purchase thus far. Do I have any regrets about offloading an entire collection as soon as I have? Not really, although packing the last of the models did give me pause for thought. It was a hugely impressive collection for sure. From a practical point of view though, the disposal of the collection - and remember that originally I only intended offloading a portion of it - has enabled me to complete (or at least further advance) a number of projects that would have otherwise had to wait. The Skirmish Show at Sidcup next week should enable me to complete a couple of ideas and so I am really looking forward to it. I have been a little out of sorts lately. I have been lethargic, woolly-headed and with occasional bouts of feverishness. I have also not been sleeping particularly well and my back and ankle (both old injuries - and neither being particularly dramatic!) have been acting up which has not helped. Everything is an effort and needless to say very little progress has been made with anything - I am feeling particularly 'wrung out' and so am now at home from week until next week and with instructions to just chill out. Hopefully some rest and downtime will enable me to shake off the doldrums and regain my former joie de vivre! In the meantime though I did manage though to get to a boot sale last Sunday and picked up the three books you see above. 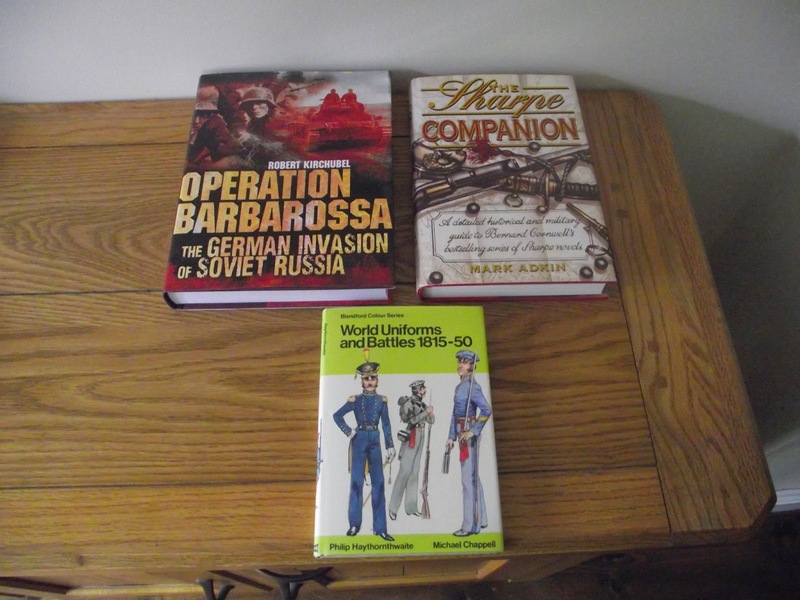 The WW2 German Special Forces title was the best of what was left as the chap was selling three titles for £2 but I was very pleased with the tank book and the WW2 naval title. I cannot see me gaming anything in the German Special Forces category but one never knows. Rather pleased with this one and I am quite fond of the rest of the series as well. The other book I acquired fills a gap in the WW1 collection in that it is a rather nice uniform guide - chock full of colour plates. I am sure there are more detailed works around but considering I am planning on using 10/12mm figures for this project much of the finer points would be lost - meaning I shan't be bothering to paint them as I certainly would not be able to see them at table ranges! I am sure I shall return to my usual form in due course but for now I am just going to spend a couple of days pottering and letting my thoughts - if I have any that is - wander to wherever. One of the things I have been pondering in connection with the Hexon desert terrain I am in the process of acquiring are its uses beyond the Middle East in WW1. The next thing for me would be something set in North Africa during WW2 - or rather a good excuse for some kit-bashing. I have always had a soft spot for the Western desert in WW2 going back to making an Airfix 88mm gun and tractor kit with may father when I was a boy. The impression stayed with me throughthe years. Which is rather embarrassing as last year I offloaded the entire Western desert section of my library so I will need to start again. 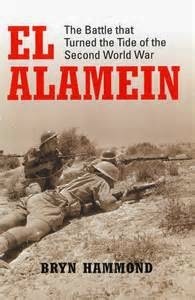 Fortunately the Works at Lakeside came to my rescue and I was able to pick a copy of El Alamein by Bryn Hammond for a mere £5.99. I have not given this period very much in the way of thought or resourcing but it would be great fun to tackle and will give me the opportunity to tackle once again the Airfix 88mm and tractor kit - Not to mention the Reconnaisance set . It will happen at some point and I suspect that once I get my desert Hexon it may be sooner rather than later! It has been an eventful week for a variety of reasons but careful progress continues to be made with both the Jutland project and the WW1 Middle Eastern collection. For the former I have placed the order with Stonewall Miniatures for the final four RN Battleships I need - a pair each of the Orion and Queen Elizabeth classes. I also collected from Mr.Fox some Vallejo paints he picked up for during one of his regular forays into deepest Southend - the Buff will be really useful as my wooden deck colour once the Humbrols have dried out. 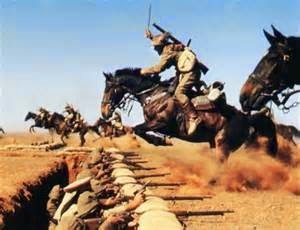 I have also ordered the last of the bases from Essex Miniatures for the WW1 Middle Eastern collection so the great rebase can get under way. Again, courtesy of Mr.Fox I have added the above title to my collection so the start of the Palestine section of the library has been made and I have already identified a couple of other books I am after in support of the project. Finally, palm trees. Bob Cordery posted me a link to a site (which I am unable to access at present for some inexplicable reason) from which I have ordered some very atttractive looking but basic palm trees which stand around 3" high and are made from plastic. Obviously they are too small to scale but with the abstract nature of my collection and terrain they will do very nicely indeed with a little TLC. Many thanks then, to both Mr. Fox and Bob for helping to fill a couple of outstanding holes! The last three models on the list are to replace the Stonewall metal versions which are really poor quality - especially the Scharhorst which is almost totally devoid of any surface detailing. I hope to post some pictures of these in the bare resin so to speak at some point and I am hoping to start the painting as soon as the last of the metal models arrive from Stonewall Miniatures. The final ships from them are a pair of Orion class battleships and the remaining two Queen Elizabeth class. I am pretty impressed with the service from Panzerschiffe as this batch took only around some 8 days to reach me although I will need to go back to them as one of the Deutschland class was missing a funnel - it had snapped off the model. Luckily it was in the bag the models were packed so a quick drop of super glue and all was well. 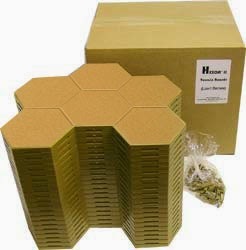 I have mentioned previously about by plans to acquire the desert Hexon terrain - initially for use with the WW1 Middle East collection. I should add though, that it goes a whole lot deeper than merely the Arab Revolt and my old historical friend T.E. Lawrence. I can honestly see me fighting anything from the time of the Pharoahs up to the Gulf War - simply because I really enjoy reading about military campaigns set in the desert. At the time of writing the plans for the Middle East will take much of my time but I see no reason why these other periods cannot be tackled - the desert after all has a rich history of conflict to explore. I would certainly like to tackle WW2 for example - certainly in a Command and Colours kind of set up. The various Colonial campaigns in the 19th century would also be a fertile ground for some games - as would the ancient period. Much to ponder then going forward and at the risk of being cliched I would certainly be happy to be described as a 'desert-loving Englishman'. Not the set I have just acquired but you get the idea. It has been a fuuny old day. This morning we were at a bootsale in the sunshine and this afternoon I was helping a neighbour bail out their front drive which was flooded due to the torrential downpour we experienced. As is the norm our garage got slightly damp in the deluge but luckily not in a serious way. 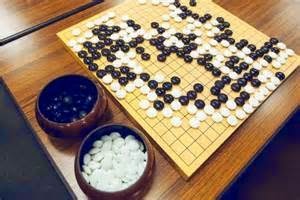 There was very little at the boot sale to speak of although I picked up a very copy of the ancient oriental board game of Go with one of the 'Teach yourself' guides as well. The game is played on a very nice wooden board with two pull out storage drawers for the pieces. The playing pieces are rather useful comprising as they do 360 black and white discs - rather like flattened sweets. Great for hit markers and similar. I am a sucker for old board games so was pleased to get this and the book for a mere £2. I spent some time organising the WW1 20mm Middle East collection now that the remainder has been listed on Ebay. I will need a few more bases from Essex Miniatures but the organisation is pretty much set. I am also happy to say that the models have a number of bids on them so the desert Hexon terrain is at last becoming rather more viable. Finally, I must extend a massive thank you to Mel Spence for a whole pile of Jutland and WW1 naval related goodies - my printer is certainly going to be busy for a while! When I recently acquired the WW1 Middle Eastern collection the first thing that struck me was that whilst some two thirds of the collection had been professionally painted the remainder had not - and the style was very different. I decided on one or two courses of action - either pickling the figures down and replicating the professional technique as far as possible (time consuming for sure) or offloading them to replace if required. For a variety of reasons I have opted for the latter option and so around some 200 painted foot figures are being disposed of - with the proceeds being used for the next phase of my Hexon collection. What is left is still far more than I would readily use for my gaming needs but I certainly feel better knowing that the disposed surplus will enable me to (at last) finalise my Hexon to include the desert set up. My WW1 armies are based around infantry units consisting of 4 bases each of two figures (40 by 20mm); the cavalry are based on units of three bases again with two figures on each (40mm square) and the machine guns and command being based on a 40mm square. Artillery I have not finalised yet but reckon that a 40 by 60mm would be about right. These are the Command and Colours standard unit sizes which will suit my set up nicely. Each side will have 12 infantry units, around 6 cavalry units and machine guns and artillery to taste. These armies are compact but as I do not expect to fight on anything other than a 13 x 9 Hexon playing area will be just the ticket. Experience using the block armies has shown that for my set up the average action usually only features around a dozen, perhaps up to 15 or 16 infantry units in total so there is an inbuilt degree of redundancy. It works for me anyway. I submitted my final order to Panzerschiffe for the remaining 1/2400th scale capital ships for the Jutland project with the exception of the four models coming from Stonewall Miniatures. In total this means that to complete the Germans I need to paint 13 models and for the Royal Navy a further 18. After this it will be on with the cruisers and destroyers. Whilst I would really like to tackle both fleets in their entirety I have hit a minor problem in that the range of models available in this scale - I am talking about destroyers primarily - is not as comprehensive as I would like and there are a few holes. I have also been thinking about the whole subject of destroyers in terms of how they will be used in the refight. I want to have these based individually as I will use them as such for lower level scenarios. I have already mooted using movement trays for formations (my current thinking is have 4 or 5 actual ships represented on a tray) but am unsure how best to tackle this. I really want to represent every ship but am fast coming to the conclusion that perhaps borrowing the idea from Paul Hague and reducing the number of models to representational levels may be the way to go. As an idea I could have base representing 4 or 5 ships with perhaps a couple of models deployed on it. This would reduce the numbers by at least a half with the damage record for a such a base reflecting the actual ships present. Should a ship fall victim to enemy action this could be recorded rather than taking the models off. It also means that I would be able make use of those models that are available more effectively so the missing files would not be such a problem. The painting programme for the capital ships is now on a minor two week break as I wait for the final models to arrive. Once they do I shall be tackling the models in three groups of 6 for the RN and one of 6 and one of 7 for the Germans. In the meantime I shall make a start on the grand rebasing of the WW1 collection. I do not have the desert Hexon terrain just yet but do have my square gridded Portable Wargame set up should I want to tackle a game. The only thing I will need to decide on is the way I will be tackling the bases. After a short interlude due to a technical issue mt desk top PC is now back with us - much improved albeit rather more noisy when in use. The repairs required meant that an additional cooling fan was needed in order to keep the hard drive suitably chilled. The original drive in fact needed replacing and ordinarily when a repair bill running into three figures was mentioned I would probably have decided that enough was enough and started looking for a replacement but, as our machine was described as being of a high enough spec to be warrant saving, we took the hit and had it repaired. The sobering lesson with this episode though was that whilst all our data (bearing in mind the PC is some 5 years old) was saved it could have been potentially catastrophic and so I shall make sure that a more frequent back up regime is in place. I have cleaned up and based the remaining capital ships that I have in my 1/2400th collection prior to readying the last of the orders for this class of ship. This will give me 12 for the RN and 7 for the Germans to complete with the remainder being ordered over the weekend. I shall finish all of these before tackling the cruisers - all 42 of them I have included the 8 RN armoured cruisers in this category) allowing for the 3 that I have - and will leave the 140 destroyers (plus the oddments) until last. The destroyers will be based and named individually but I will be experimenting with some movement bases for these as it will make life easier when I tackle 'Der Tag'. My thoughts at this stage are around using bases of 4 models deployed in two ranks of two ships but I will experiment in due course. The other question I will need to spend some time on is ascertaining the colours to paint the models. There are mentions in the book Death in the Grey Wastes of British ships being painted black (I thought at this period they were grey and the Germans vessels were black - at least until 1917) so a little research may be needed to decide this. Initially I wanted to to paint the RN grey and the Germans black as this makes for easier identification and I have no desire to attempt researching individual ships colours if I can possibly avoid it! Of the 21 models on the painting tray the 12 RN ships (4 battle cruisers and 8 battleships) are all undercoated and I plan to make a start on painting these over the course of the coming weekend with, as usual, pictures on the blog in due course. Following on from my previous post I have taken the decision to formalise my Jutland project - by which I have set up a dedicated folder on the blog which will contain all posts relating to the progress of the same. To start with, I have drawn up a couple of lists of models needed and models currently owned - whether painted or under the brush. This was also a useful exercise in that it acquainted me with the ship classes involved. Thus far I have tackled every ship type except for the destroyers and the results were mixed to say the least. Capital Ships: For the Royal Navy I currently have 12 ships under the brush - 8 battleships and four battle cruisers. To complete the capital ship category I will need to buy a further 7 models - 6 battleships (of which 4 are Stonewall metal models and the remainder will be from Panzerschiffe) and a single Invincible class battle cruiser. The Germans are more straightforward in that I have the remaining 7 dreadnoughts in stock and so will only need to buy the ships of the 2nd Battle squadron - the pre dreadnoughts. These will be from Panzerschiffe. Cruisers: I will need to get all of the Royal Navy armoured cruisers (8 in all) and then some 24 of the 26 light cruisers present. For the Germans I can muster 1 of the 11 ships present. All of these models will be coming from Panzerschiffe. I am planning this project on a top down basis and so the capital ships will be finished first, followed by the cruisers and then the destroyers. Whilst I was pretty happy with the capital ship side I was less so with the cruisers - I will need rather more than I had first thought. Whilst I have not really given much thought to the rules I shall be using the issue of the space required has given me much to think about. I am hoping to be able to fight smaller actions (perhaps the outlying cruiser fights) on my 6ft by 4ft but anything larger will need an alternative solution. The floor in my man cave in the loft has a rather fetching blue/grey carpet and so this would give me (subject to some furniture being moved around) an area easily of some 7ft by 12ft. As you are already on the floor when you enter the loft it would even save having to get up! The destroyer issue will be a major consideration as there were so many of them present. Luckily Stonewall feature an M class model in their range which will serve for a variety of types. The Germans are less fortunate though so Panzerschiffe and others will be needed to flesh out their escorts. I had hoped to have written my post holiday post with a few pictures of a rather interesting couple of forts in Portugal (just over the border from where we were staying) but sadly they are on our desk top computer which has thrown something akin to a hissy fit and is currently in drydock as a result. That particular post will have to wait for a few days then as rather foolishly I deleted the pictures from the camera as soon as I had uploaded them. What I will do though is to detail the various ideas I came back with in respect of the second half of this year and beyond for my gaming purposes. There is nothing unexpected methinks although one idea may come as a little surprise. 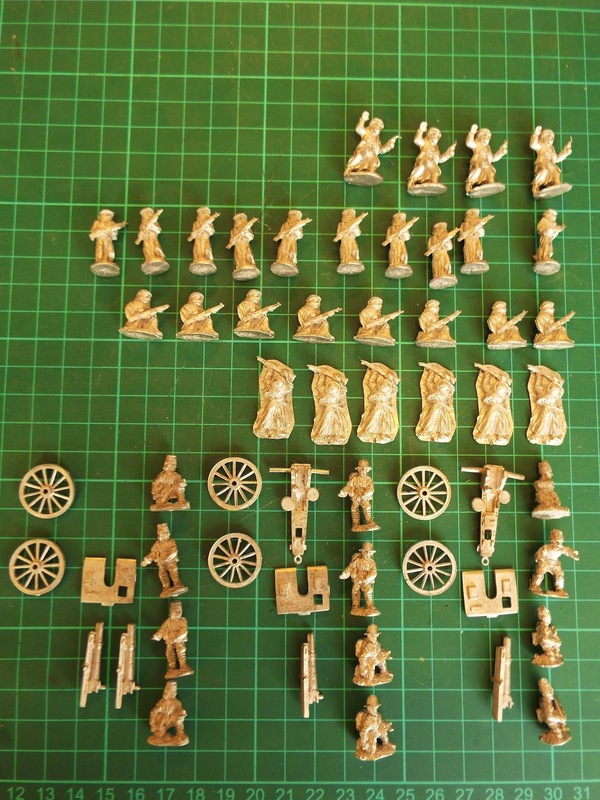 WW1 20mm Middle East: The first task will be the rebasing of the first tier of figures - those that were professionally painted - and then I can consider how to tackle the remainder. I have in mind a campaign style set up for this lot based loosely on the legendary Madasahatta campaign run by Eric Knowles back in the late 1970s/early 1980s. As a knock on of this project I will need to consider the second line naval dimension so lots of old cruisers and pre dreadnought battleships will feature in due course. I should point out that due to the arrival of the above collection my plans for a WW2 Middle Eastern campaign featuring the Turks have now been shelved, at least until the WW1 project has been tackled. The Moors in Spain: This was the title of my holiday reading on my Kindle. 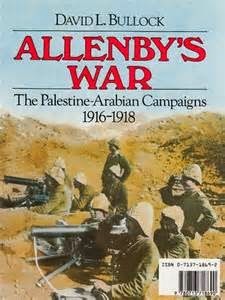 The title was written by Stanley Lane Poole during the 19th century (he also wrote a good history of the Barbary Corsairs) and whilst is a little dated is a first class read. 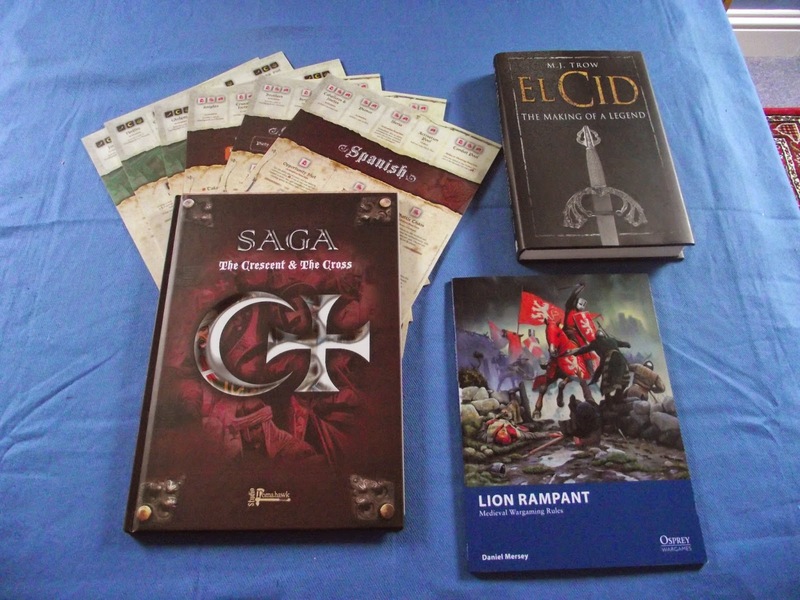 There is much gaming potential for some really good 9th to 11th century games set in the Spanish peninsula and featuring much in the way of battles, raids, skirmishes etc - even more so when you factor in the whole El Cid thing. I fancy tackling a couple of DBA armies for this for the sheer fun of it. The funny thing with all of the above is that none of the ideas mentioned are new and all have featured at some point in my planning. Aside from the Moorish collection much work has been done already and I am in no hurry to rush something into completion - I want to enjoy the process and so bite-sized chunks are very much the order of the day! ...and I survived to tell the tale - despite the best efforts of the creature below (a jellyfish if you had not worked out what it is yet) and several thousand of his compatriots! This was an average sized sample - the largest one we found measured some 18" across the dome! Seriously though, lots to tell once we have gotten unpacked so watch this space over the next day or so. 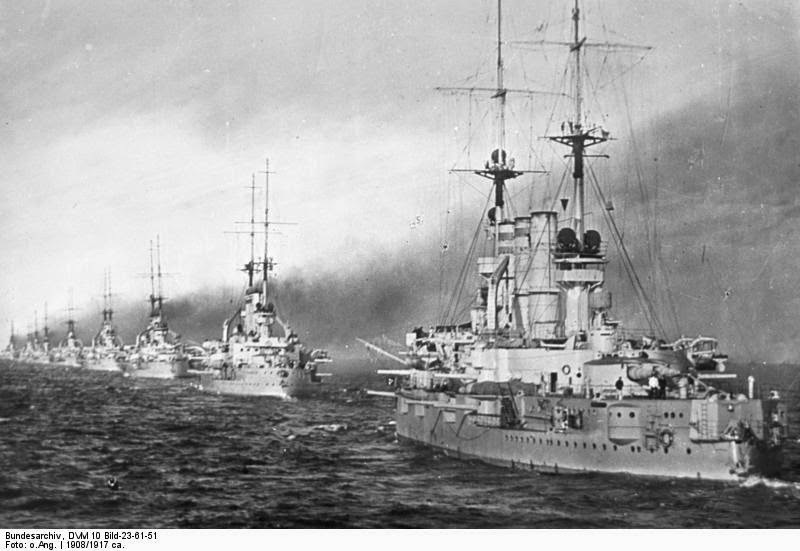 A group picture of the three 11" armed German battle cruisers - they are now joining the remaining ships of the First Scouting Group: Lutzow and Derfflinger so I have the complete line up for Jutland of all five vessels. I have at last managed to finish the remaining dreadnought capital ships for my WW1 German High Seas Fleet. I have added an additional Kaiser class battle ship (making 3 out of the 5 built - the other dreadnought classes were each of 4 ships represented by 2 models) and have also completed the earlier 11" gun armed battle cruisers. 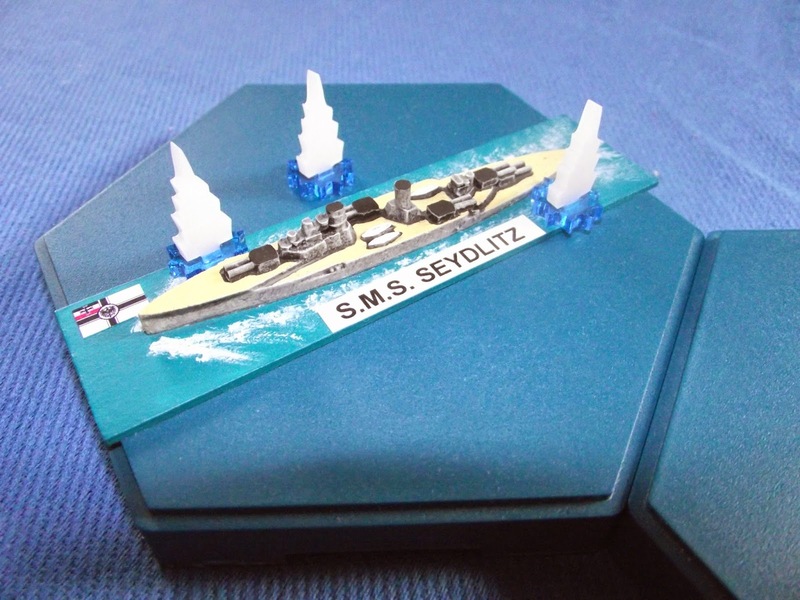 The sole battleship is a metal Stonewall Miniatures model whilst the remaining vessels are all from Panzerschiffe and are cast in an epoxy resin. The painting technique is my by now familiar black undercoat and dry brushed shades of grey with the decks and ships boats picked out. The last of the 11" battle cruisers built for the Germans and a particular favourite of mine. One of a class of two ships - the second joining the Ottoman navy and helping to push Turkey into the war alongside Germany. The first of the German battle cruisers. S.M.S. Goeben as she was renamed in Turkish service. She was the last of the German capital ships in service and was modernised on a couple of occasions and finally scrapped in the early 1970s. Turkey had offered to sell her back to the West German government prior to scrapping her but sadly they declined. The Germans now possess the heavy units comprising the First Scouting Group as it appeared at Jutland in 1916 - Lutzow, Derfflinger, Seydlitz, Moltke and Von der Tann back up by the 9 dreadnoughts of the High Seas Fleet (bear in mind these are based on the Paul Hague system of each pair of battleships being represented by a single model for scale purposes). I have collected the battle cruisers for both sides on a 1:1 basis simply because the numbers involved are fewer and will look better in any games I choose to fight. As they routinely were at the forefront of the main battle fleets this makes a lot of sense - at least it does to me! Now back to the British!